Humana Inc.’s (NYSE: HUM) signature Humana Healthier Choices program has guided festival-goers to healthier items available at Taste of Chicago, the world’s largest free admission food festival, for ten years. Since its inception in 2008, the program has grown from 11 to 71 healthy dishes, reaffirming that eating healthy is possible – and delicious – for food festival attendees. The 2017 Humana Healthier Choices – selected based on calories, saturated fat, sodium and ingredients by a panel of physicians and nutrition experts – showcases 71 healthy food options from 29 Chicago restaurants. Nearly half of the festival’s food vendors are offering the healthier items this year. To accommodate various diets, the list also highlights 17 vegetarian items and 16 gluten-free items—nine of which are also Humana Healthier Choices—available at Taste of Chicago. All restaurants participating in the 2017 Taste of Chicago were invited to submit their dishes and nutritional details, including calories, sodium, saturated fat and ingredients, for consideration by Humana. A panel of five top Chicago-area physicians and nutrition experts carefully reviewed each item to assure that nutritional values were met. The panel included: Kathleen Duffy, M.S., R.D., Diabetes Nutrition Educator, Rush Oak Park Hospital Diabetes and Endocrine Care Center; Neal Fischer, M.D., Humana Regional Medical Director, Medicare Operations, Great Lakes Region; Amy Hess-Fischl, M.S., R.D, Advanced Practice Dietitian and Program Coordinator at University of Chicago’s Kovler Diabetes Center; Donna Perisee, M.D., Ph.D., Humana Medical Director, Medicare Great Lakes Region, Health Services Organization; and Donna Prost, MS, RD, LDN, CDE, Adult Diabetes Education Manager, Amita Health Diabetic Education Services. The Humana Healthier Choices food items are identified by a green “H” with a circular arrow around it and can be found on the menu boards at participating restaurant booths. 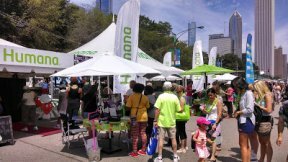 The Humana Healthier Choices list will be handed out at the Humana tent, located on Columbus Drive between Jackson Boulevard and the Buckingham Fountain. The list can be found in the Taste of Chicago brochure. It can also be downloaded at the Taste of Chicago website, via facebook.com/TheTasteOfChicago and through the Taste of Chicago app. The 37th Annual Taste of Chicago is July 5–9 in Grant Park. Hours are 11 a.m. – 9 p.m. from Wednesday to Friday, and 10 a.m. – 9 p.m. on Saturday and Sunday. For more information on the free admission festival, call (312) 744-3316 or visit www.TasteofChicago.us.